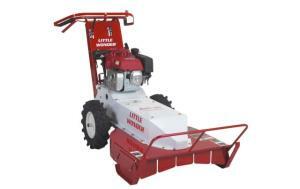 The Little Wonder Hydro Brush Cutter navigates through weeds, heavy brush and overgrown vegetation with ease. We've even cut the cords with solid rod linkage to transmission, park brake and cutter blade clutch for worry-free cutting. * Please call us for any questions on our brush cutter walk behind rentals in Hillsdale and Ridgewood NJ.